Our team at Flower City Glass has proven experience with aluminum or metal framed commercial skylight and canopy systems. We can assist in design, selection and installation of units ranging from simple 4-sided pyramidal skylights to custom designed, complex skylight structures that will bring natural light into your business or home. 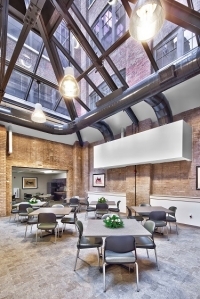 Aluminum framed skylights are glazed with high-performance low-E glazing to protect interior furnishings and provide for natural daylight without solar heat gain or damaging UV rays. 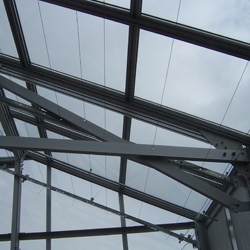 Exterior canopy structures can be installed on existing or new structural components with glazing ranging from standard clear lites to silkscreened, patterned decorative laminated glazing set in aluminum or stainless steel clad systems.